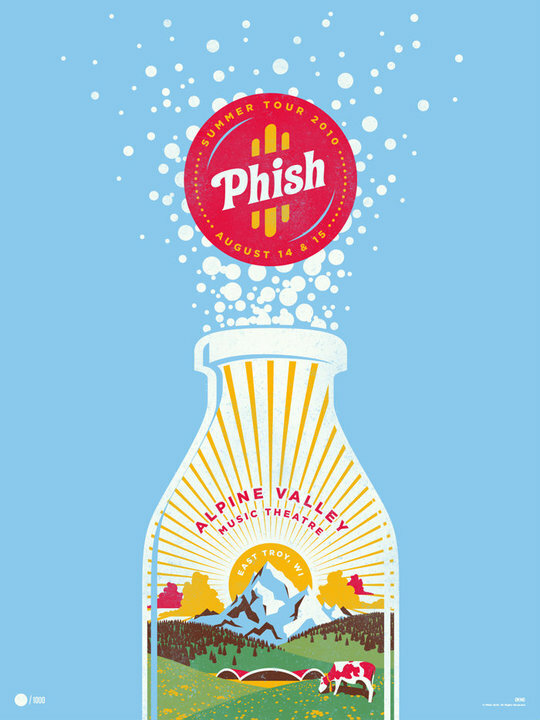 One week after peaking The Greek stand with a finale built upon a monumental “Light,” Phish found themselves in Alpine Valley, ready to build off two-solid efforts in Deer Creek. 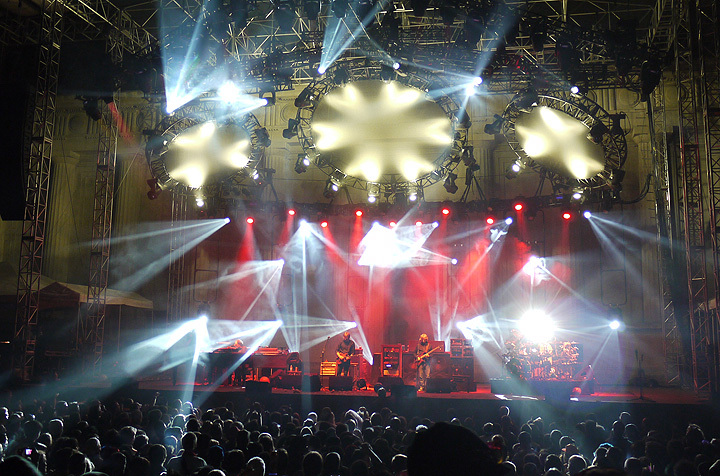 After imploding Berkeley with jams of all shapes and sizes, the band’s innovation continued through Telluride’s “Piper” and “Carini” and several pieces, specifically “Drowned” and “Light,” in the cornfields of Noblesville. But as Phish prepared to step onto their biggest stage of summer, the second improvisational peak of Leg Two lurked right around the corner. A blistering opening half set the table for a break-neck psychedelic roller coaster ride of “Down With Disease > What’s The Use?” An illustration of Phish’s willingness to push forth to find that magic moment, this jam awakened the band’s musical patience and brilliance while careening into the future. When Phish pulled into their classic Wisconsin shed, Trey had grown fully accustomed to his new Ocedoc and unleashed it ferociously. Completely in the zone for the entire evening, Alpine’s opener brought one of Trey’s most dazzling evenings of the entire summer. Coupled with morphing bass-leads from Gordon and a whole-band precision, Phish had primed Alpine Valley for a mind-melting escapade. Uncharacteristically dropping “The Sloth” to open set two, a dark vibe immediately encompassed the show. And when the beginning rumblings of “Disease” started, one knew things were about to get bonkers in dairy land. Tearing into the song’s composed jam, Trey sped off like a hyena on tornado juice, shredding leads from the get-go in a spectacle of six-string acrobatics. Playing powerful and flowing lead melodies, Trey caught fire at the onset of this piece and his playing flew off the charts throughout this futuristic excursion. The entire band annihilated the straight-forward “Disease” textures at a torrid pace. Showcasing the Ocedoc’s unmatchable tone, Trey darted through creative patterns with mind-numbing speed and dexterity. Through this entire opening segment, Mike sat in the background as part of the three-way support for Red’s scorching solo, but it was when Gordon emerged from this role, weaving his lines around Trey’s offerings and bringing original ideas into the mix, that the jam really gained liftoff. Following the blistering opening, the band took a musical step sideways into a rock pattern that retained roots in “Disease,” but simultaneously drifted from the song’s structure. Mike comped Trey’s lines with eclectic rhythms as Page infused the music with dirty clav hits. 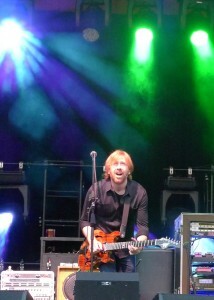 After Trey peaked his high-octane shred-fest, Phish began to darken the piece without losing their fire hose intensity. Trey began slicing the air with snarling rhythm licks while Mike’s creativity blossomed into the foreground. This is the first of several junctures that Mike pushes this “Disease” jam further into the unknown, eventually resulting in an effortless and filthy segue into “What’s The Use?” In each instance, the entire band hopped on Mike’s new direction, this time molding their musical play-doh into spacier realms. The band momentarily deconstructed the piece before Trey built it back up with quick rhythm chops, bringing the band into a less ordinary percussive sequence. Mike delivered a slower bass line amidst this ridiculously tight section, again subtly prodding the band into riskier territory. 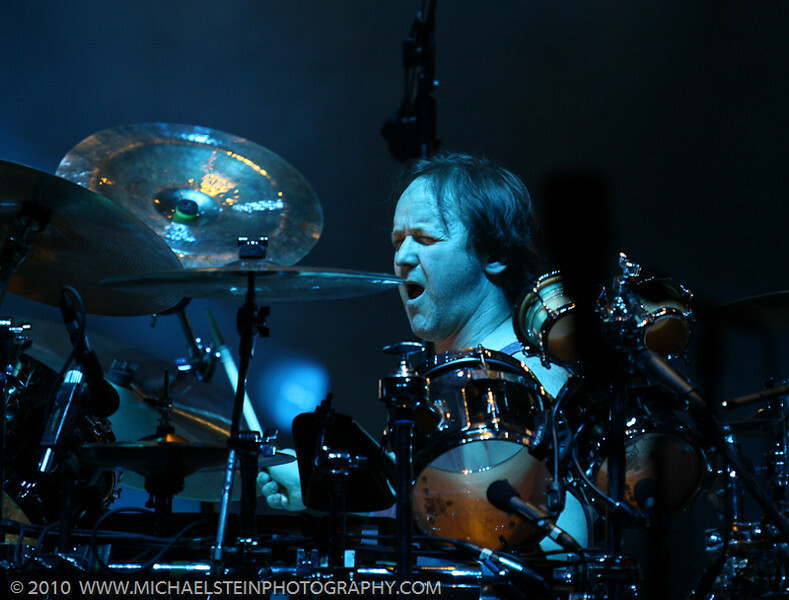 Fishman gradually merged with Mike’s concept, slowing the rhythmic pace while never losing his sense of urgency. As the tempo waned, the resulting music grew quite abstract as all four members poured their phrases into an inter-stellar sonic brew. 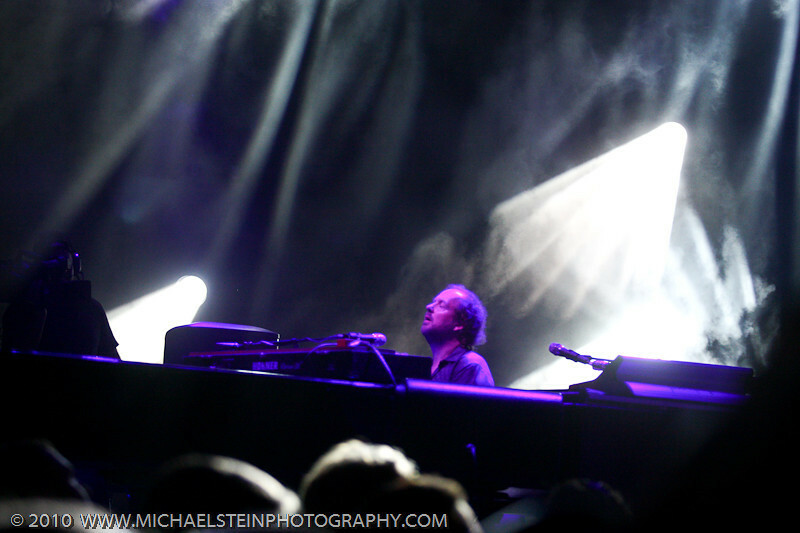 Trey and Mike continued pushing the music outward while the jam retained its whole-band cohesion. Entering a section of harrowing psychedelia, Trey shone brightly while sprouting cosmic melodies amidst this sinister milieu. Mike made another noticeable change, offering a distorted pattern that would slowly lead the band towards a fluid groove, and eventually into their to-die-for transition. As Phish built a menacing wall of sound and effect, Trey speckled the landscape with heart-tugging leads while the band settled into a transcendent passage of ambient groove. Stretching this portion of sorcery, the band drifted into one of the most indelible and emotional sequences of the summer. Realizing where their music had reached, Trey magnificently wove a lick of “What’s The Use?” into the jam and the entire band was already there. Without any change of beat or musical alteration, Phish achieved the most marvelous musical arrival of tour, leaving the audience in total awe. Flowing naturally and sculpting a larger-than-life soundscape, Phish brought a cathartic resolution to their extraordinary journey. “What’s the Use?” dripped, note by note, over the massive audience: a seething, psychedelic fable. Stemming from one of the band’s hallowed vehicles, this jam immediately sat side by side The Greek’s multi-thematic “Light” as the improvisational zeniths of tour. And the most fascinating part about these two jams is their vastly divergent paths, illustrating Phish’s ability to crush many types of music once again. No longer a one-trick pony that galloped from rock to percussive grooves to ambient outros a la ’09, Phish took the the standout jams of Leg Two in totally unique directions, foreshadowing a thrilling fall tour. 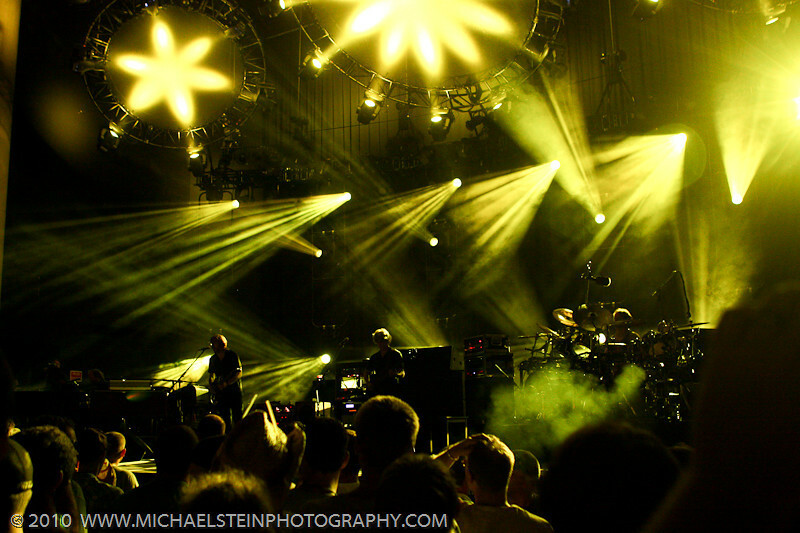 You’ve read about it; now you can listen one of Phish’s peak moments of August. Yesterday Hidden Track posted detailed survey results of all things related to Phish’s Summer Tour, and Phish Thoughts was voted the “Must Read Tour Blog!” I just wanted to take a moment to thank each and every reader that tunes in while on tour and/or off tour, contributes to the ongoing conversation in the comments section, or simply grabs a download. Phish Thoughts has transformed into a vibrant community that far exceeds anything I ever imagined. So, “Cheers!” This place is as much about you folks as anyone, and here’s to a ridiculous fall. See you on the road! Here is Alpine Valley’s phenomenal two-set showcase from the stand’s opening night. 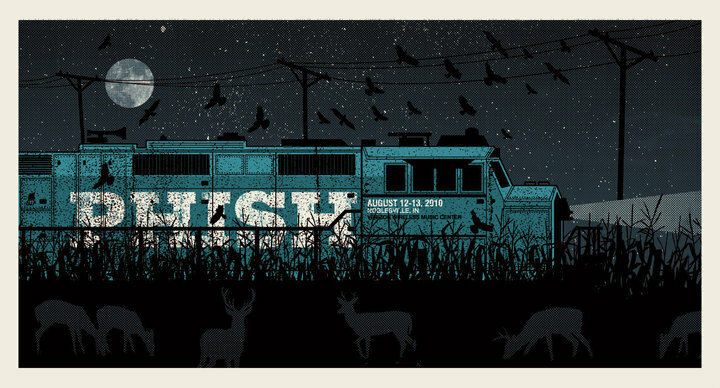 Phish opened the second set with one of their defining open jams of summer in “Disease > What’s The Use?,” and followed up a mid-set “Mule” with a ferocious “Mike’s Dirty Sally Groove.” A relentless first set is highlighted by a gorgeous “Reba,” a semi-rare “Taste,” and the fiercest “Antelope” of Summer 2010. If Leg One of Summer was defined by bust-outs and covers, Phish got back to business during Leg Two by underlining their shows with quintessential exploration. Jumping outside the box right away, Phish returned the focus of their shows to improvisational exploits, laced with new-school twists. For the first off-season since the comeback, we now have plenty of next-level musical excursions to relive and dissect: refined and focused jams that stand up to standards of old on re-listen. 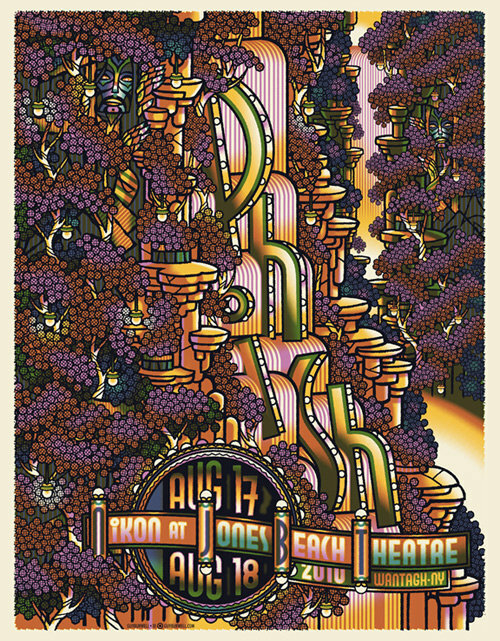 This tour, all band members caught up to each other, and when that happened, Phish’s exploratory spirit took over and became a driving facet of their playing throughout August. 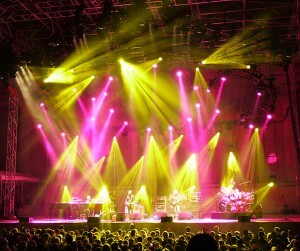 In three shows at The Greek, Phish blew open multiple jams, setting a clear precedent for the rest of the tour. Beginning with “Disease” and “Tweezer” and continuing with “Cities,” “Rock and Roll” and “Simple” during the sequel, the band grew more connected each night. 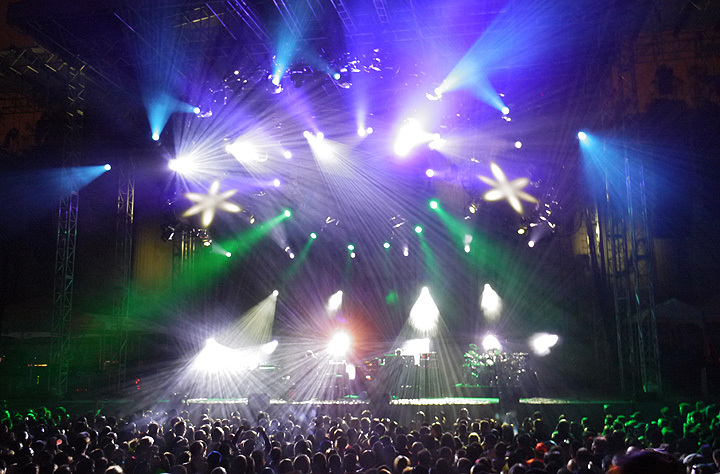 Peaking in full bloom during The Greek’s final set – one of summer’s finest – Phish navigated an odyssey through “Light,” producing one of tour’s improvisational high points. 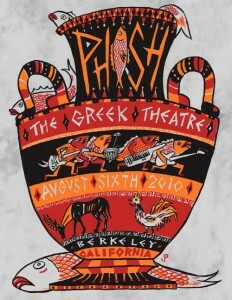 Playing a Berkeley run during “Jerry Week,” there was a palpable buzz of a possible Dead cover, but Phish couldn’t have given a greater tribute to Garcia than this cerebral and intricate masterpiece that became the defining open jam of summer. When Phish revved their cosmic launchpad as the second song in the second set, an impending sense of greatness hung in the crisp California air. Growing progressively larger throughout June, “Light” had left off in Raleigh with the tour’s best rendition. 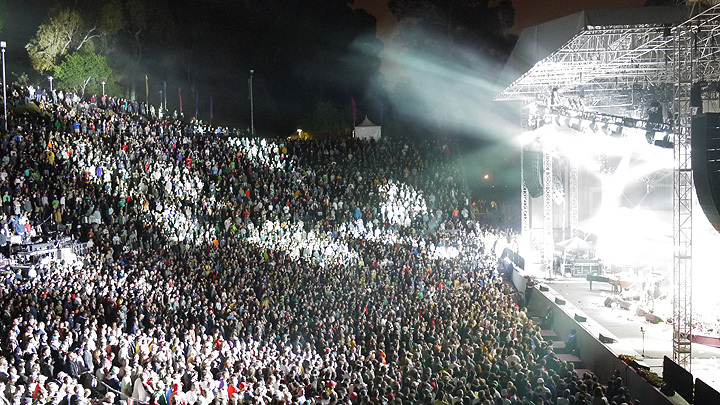 But when the band unveiled their current centerpiece in Berkeley’s mythical amphitheatre, it became quickly apparent that Phish would delve deeper than usual – and that they did. Steering a multi-dimensional journey through tapestries of sound, the band merged virtuosic ideas into cohesive musical themes, resonating universal frequencies in their stone surroundings. The pristine sound enhanced the quality of the ethereal experience, as the band set sail on a voyage into the heart of the unknown. Phish burst out of the gates with a unique and scintillating composed jam in which Trey wove a beautifully atonal solo. But as opposed to June, he ran up and down the fretboard, accurately hitting every note of his melodies rather than altering his pitch with his whammy pedal. An increasingly twisting trail led the band through a darker passage that settled onto a fresh musical plateau. As if composed, Page began a melody that Trey immediately latched onto, shooting everyone directly into the spiritual realm without warning. As Mike backed their ideas with a low-as-possible bass pattern, Trey and Page wove a stunning tale of beauty with which Gordon quickly harmonized. Morphing into a soul-melting passage of sublime Phish, the band members tossed musical ideas around like a magical hot potato, subconsciously building off each other and stretching the music into the stratosphere. Losing all sense of time and place, the entire band rode a wave of blissful momentum, caring not where they might end up, but knowing that each and every moment along the way felt exactly right. Showcasing their one-minded jamming, Phish took a swan dive into the void, coming up with their most profound musical statements in quite some time. Feeling no hindrance and pushing further into uncharted realms, the band narrated a sonic fantasy that enraptured the psychonaut in everyone. 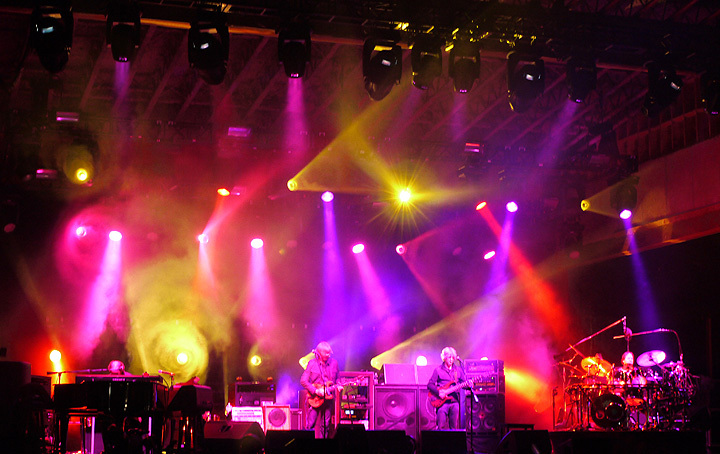 Darkening the jam with intertwining leads, Trey and Mike organically brought the piece into a section of underworld grooves, where the entire band adapted like chameleons to their changing musical surroundings, never missing a beat while continuing their path of wonder. 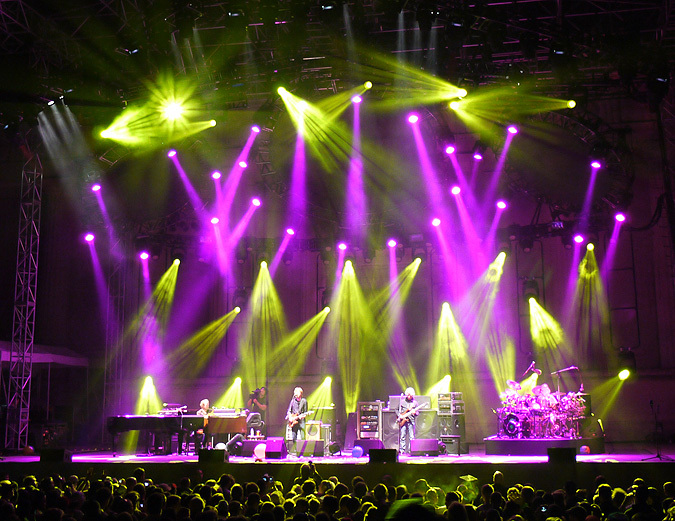 Flowing into more abstract and tribal rhythms, Fishman urged the band into increasingly dramatic territory, and Mike and Trey responded with furious leads, bringing the jam to a head. A monstrous piece defined by its non-linear, yet totally cohesive, journey, The Greek “Light” moved through four distinct sections without ever losing a micro-particle of momentum or flow. With all four members playing masterfully and connecting entirely, the result became an other-worldly piece of Phish music, regardless of era. As the band pushed their newest sound this summer, their most impressive jams stood up to any age in their past, a sure sign that the future is glowing. 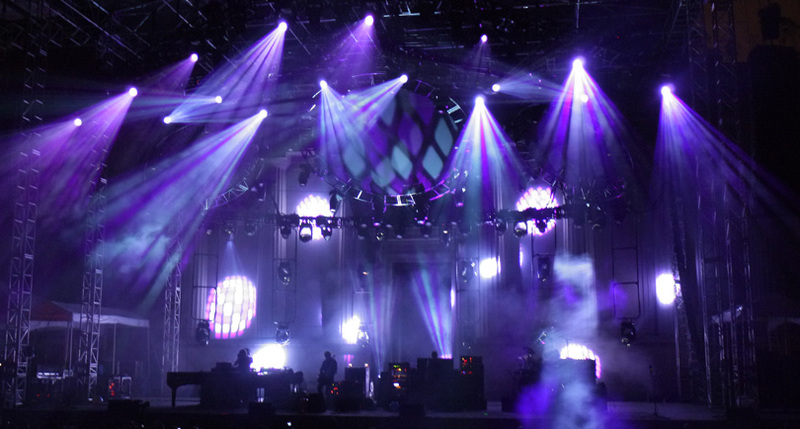 “Light’s” ornate excursion provided the first peak of tour, while Phish would hit a second high point a week later in Alpine Valley with “Disease > What’s the Use?.” And there were a plethora of surreal jams that surrounded these two behemoths. This week, we’ll look at the most significant musical moments that made Leg Two of Summer 2010 – The Tour We Made Contact. 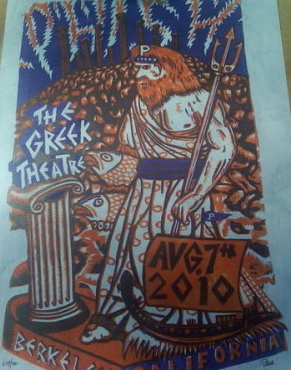 Here’s The Greek’s regal version of Phish’s classic amidst a summer that completely revitalized the song. The band’s playing on this rendition set a modern precedent for “Hood” jams, furthering the elegant vibe of the final set in California. Deer Creek’s finale provided two more balanced sets than the opener, with the second divided into dark and light. The more sinister segment read “Light > 46 Days > Maze” and the lighter half was delivered “Meatstick > Mango,” “Fluffhead,” “Julius,” forming a yin and a yang to a well-played set. The modern era debut of “Walls of the Cave” and a serious “Stash” highlighted a solid opening stanza. 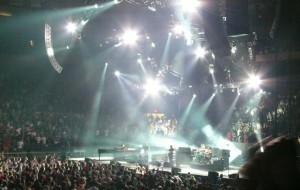 After a sloppy opening frame, Phish came back with one of their more creatively constructed sets of tour. “Drowned” brought the band into a new-school rhythmic-ambient jam, while they connected “Jibboo > Gin” with a seamless segue. 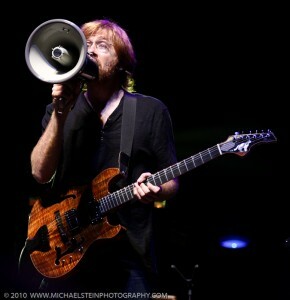 Trey left the whale behind on this second set “Bathtub Gin” using his Ocedoc to carve melodies into the summer night. After a quality mid-set interlude, Phish capped the evening by deconstructing “Split” into “Dog-Faced Boy,” and an impressive “Hood” which passes through an unorthodox segment of darkness on the way to the top. All-in-all, this show is flying under the radar due to larger explosions at The Greek and Alpine Valley. A playful excerpt from Deer Creek’s opener. I’m on a long weekend with my family and will be back Monday with my regularly scheduled breakdown of summer’s second leg. This underrated jam from The Greek followed up the opening night’s “Disease” as the second example of Phish’s newest jamming style. Look for Fishman’s dynamic rhythms that frame the band’s melodic interplay in the second half of the jam. 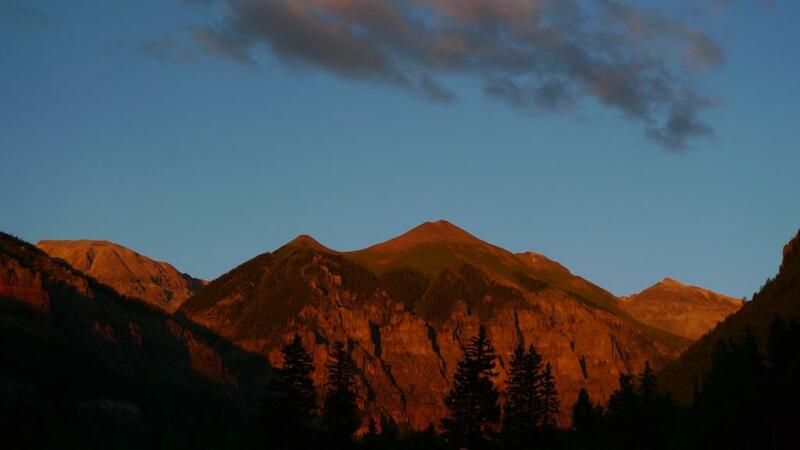 A solid, straight-forward rock show in the mountains. 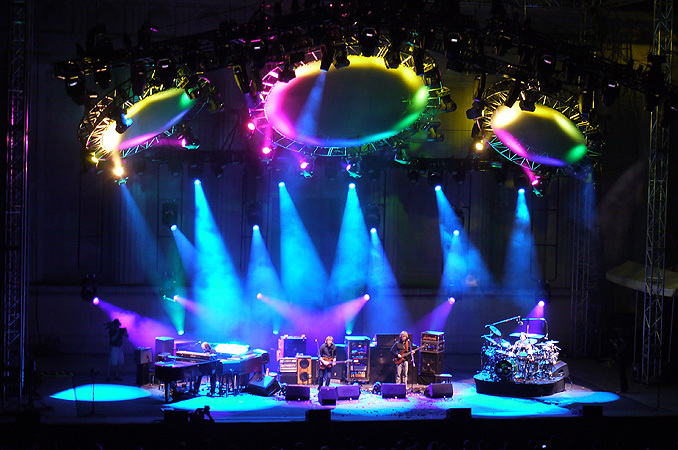 “Carini” and “YEM” highlighted the second set, and “Mikes > Crosseyed” ain’t too shabby of a combo either. During Phish’s 2009 Fall Tour, actual market price for tickets on lot ranged from “free” to $20. Perhaps catching wind of this decreased demand and wanting to increase the buzz again, Phish and their management crafted the path of Fall 2010 quite differently. Or, feeling they are on the brink of a late-career musical breakthrough, perhaps Phish is actively trying to get back to a place where they can discover their new sound in the type of rooms in which they came of age. But regardless of motive, the band made an unprecedented move yesterday, announcing a 14-show fall tour comprised of minuscule venues with capacities ranging from 5,700 to 14,700, instead of returning to their staple arenas of the east coast and Midwest. 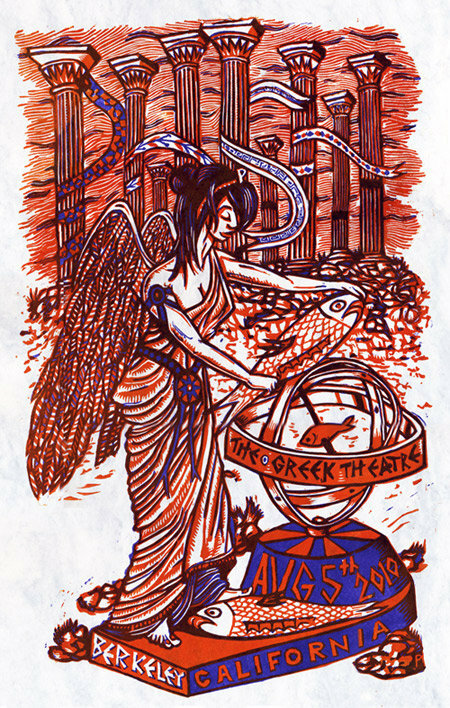 With seven GA shows and seven shows that have GA floor and reserved seating, Fall 2010 will be a throwback to the 1994 era when Phish played college towns and minor-league arenas across the land. Following a stand-alone festival set at Austin City Limits, Phish will kick off their retro-tour, proper, with a three-night stand in Broomfield, Colorado on October 10 – 12, where they will play the brand new 1st Bank Center with a tiny capacity of 6,500. Along their three-week road, the band will also play two more sub-10,000 person shows in Augusta, Maine’s Civic Center (6,777) and Utica, New York’s Memorial Auditorium, boasting the tour’s smallest capacity at 5,700! 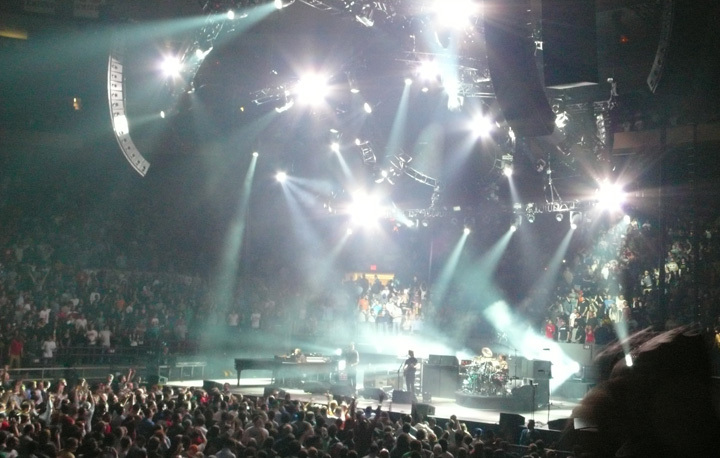 Just pushing the 10,000 mark are Verizon Wireless Arena (10,050) in Manchester, New Hampshire, a relatively new venue an hour from Boston, and University of Massachusetts’ Mullins Center (10,600), the site of more than a few epic nights of Phish in 1994 and 1995. The largest shows of the tour will take place at Boardwalk Hall (14,770) in Atlantic City for a three-night Halloween blowout, just down the road from New York City and Philadelphia where Phish routinely sells out Madison Square Garden and The Spectrum / Wachovia Center. North Charleston Coliseum (14,000) in South Carolina and a revamped Dunkin’ Donuts Coliseum (14,500) in Providence, Rhode Island, round out this Fall’s docket of venues, two undersized arena the band hasn’t visited since Fall ’96 and Winter ’99, respectively. Get ready for Time-Travel Tour – 2010. The exponential increase in intimacy will be the immediate effect these dream-sized venues have on evenings with Phish. 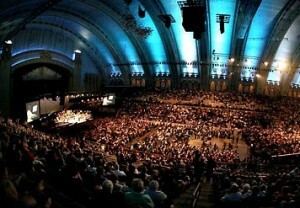 Instead of hearing mind-melting “Light” jams with 20,000 others, consider 6,000 – indoors. Waking into these GA venues, everyone will feel on top of the stage, regardless of where in the room they end up. With a fan base used to impersonal, super-sized arenas since the band made the permanent jump in 1996, these Fall experiences will be eye-popping from their smaller size and scope. And just imagining the sound of Trey’s Ocedoc in these mini-rooms…forget about it. 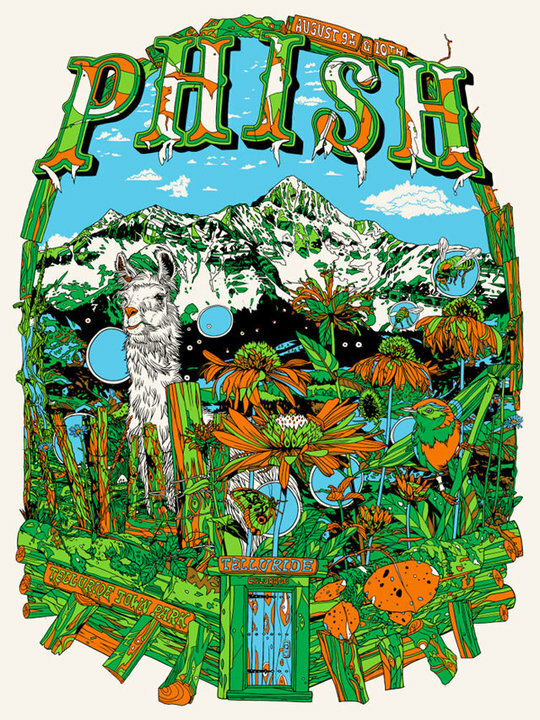 Creating a distinctly new-school/old-school vibe for this tour, maybe Phish will begin weaving more fall tours of the like after their amphitheatre circuits of summer. But maybe this is specifically for a place in time: a step in the band’s reinvention. 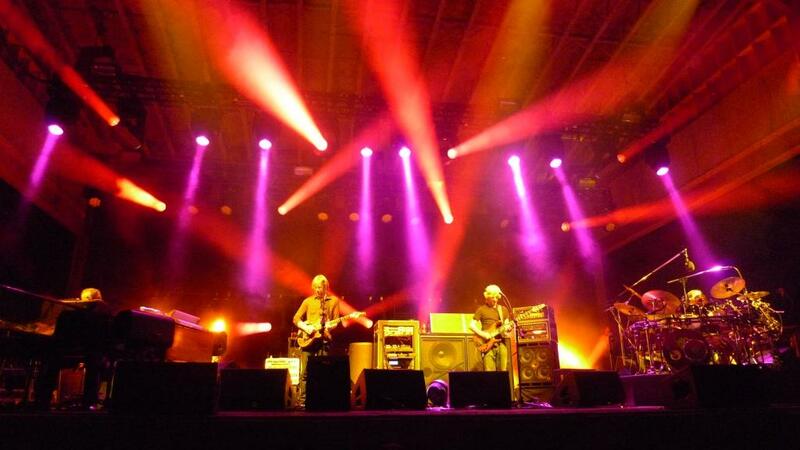 Juicing Leg Two with more creativity and direction than we’ve heard in years, these smaller settings will provide more intense experiences for the band as well as the crowd, and these venues will reproduce the settings where Phish blew the roof off of things in ’94 and ’95. For those who jumped on after the fact, fall tour will provide a small taste what things once were. And for the band members, themselves, maybe that is their goal. One side-effect of downsizing shows by such a significant percentage is that Phish immediately created a frenzied ticket market for – literally – each and every night; the diametrically opposite of last Fall’s “roll to the show with a $20 and get a ticket on the walk in” dynamic. With such small numbers in Phish’s wheelhouse region, will brokers step back into a scene in which they took a bath last year? Tickets are tickets for GA shows, making scoring and trading tickets amongst the community easier and more equitable. It will be interesting to watch what will actually transpire in the ticket scene over the next six-weeks before tour. Any way one slices it, Phish has a clear intent to tighten up their shows this fall, creating far more intimate indoor affairs than we’ve grown accustomed to in recent years. The live experience will certainly be something new for the first time ages, bringing a certain buzz to the scene as soon as the rumored dates proved true. With a clear opportunity to sell more tickets across the board, Phish has, once again, chosen to downsize, following their modern era trend. Best of luck with tickets folks, because if any of this means anything, this Fall is going to be something to behold. Mail Order here until Friday, September 3rd at Noon Eastern. A smoking version that came from the Rockies; tighter and more focused than many “Pipers” of this era. One constant throughout Trey’s career has been his Languedoc guitars. While other guitarists switch between instruments for different songs and effects, Trey always slung his one trusty guitar over his back. Having gone through several versions in his twenty-year career, Trey’s Languedoc produced the soul-tugging tone that legions of fans fell in love with throughout the 1990s. His guitar tone defined the band’s sound for years and his axe never failed him. Thus, when Trey took time to publicly unveil his new guitar at The Greek with the following introduction, everyone took notice. Well, after only one tour with his guitar, the magic piece of wood has completely bolstered the sound of the band. 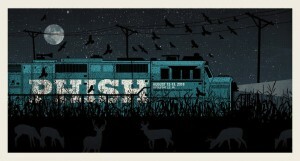 One would have to be three sheets to the wind to not notice the considerable effect his new piece has had on Phish. After The Greek, the band posted mouth-watering pictures on Facebook of the new guitar with a gorgeous Ocelot inlay. After seeing these images, fans immediately dubbed the guitar the “The Ocedoc” and the legend had began. But the real story of The Ocedoc played out night after night, and set after set, as Trey continuously carved through the music with his new sonic juggernaut. Carrying a much fuller tone that never reached the treble-heavy peaks of his last guitar of legend, The Ocedoc sounds obviously superior to his all his prior instruments. Rich and deep, resonant and nuanced, Trey’s magic guitar holds the low-end sustain incredibly well, and his micro-control of its voice is striking. Just as importantly, Trey’s bolstered tone provides a far more congruent match for Mike’s unusually broad range of sounds. Put into play, The Ocedoc sounds stronger than ever in wide-open shredding, but it is the intricate control Trey exhibits within the band’s collaborative jams where his new guitar becomes most effective. His enthusiasm and propensity to contribute creative leads with his shining toy severely decreased his use of the whammy pedal (aka “The Whale) throughout the second leg, resulting in far more intense and creative jams. Without dominating pieces with overwhelming solos or responding to his band mates with copious pitch-bending, The Ocedoc’s responsiveness allowed Trey to contribute with both passion and finesse to the most exquisite jams we’ve heard in years. From “Reba’s” to “Hood’s” and from “Lights” to “Tweezers,” the difference made by The Ocedoc in Phish music became staggering. Like a kid at play with the coolest toy he’s ever had, Trey took the stage night after night, slaying everything in his path. I noticed a palpable difference in The Greek’s “Maze” and “Tweezer” before he told us about his magic guitar, though I thought the difference was on my end, or due to The Greek’s pristine acoustics. But lo and behold, what I heard were not aural hallucinations, but the dawning of a new age – The Era of The Ocedoc. 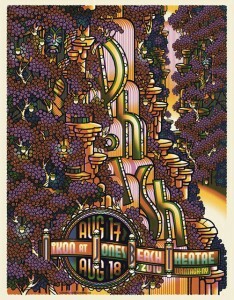 Audibly stronger as the tour progressed, check out Trey’s work throughout Alpine’s two nights for particularly vibrant examples of The Ocedoc out at play. With his magic guitar leading the way, Trey and Phish are ready to take fall tour by storm in what is quickly becoming a highly-anticipated, small-venue, run of shows. Look for an announcement sometime today to find out when your next chance will be to follow The Ocedoc! The peak of Phish’s run at The Greek, with a second set that rivals any since the return. Much more to come about this amazing evening by The Bay. A year and a half after hitting the stage at Hampton Coliseum on March 6, 2009, the band we know and love has returned to glory. 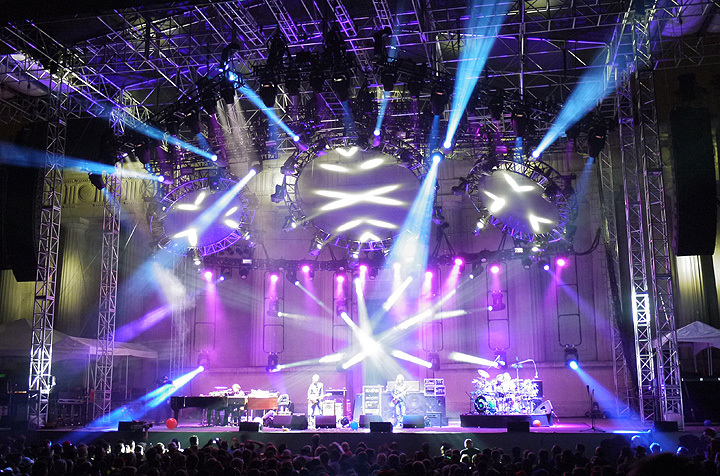 After a triumphant second leg of summer tour that saw Fishman and Trey fully enter the zone again, Phish is once again firing on all cylinders. No longer is Mike just dropping bombs, or Trey shredding solos – a whole-band ethos has emerged in which the best live moments materialize when no single person is dominating at all. Over two weeks in August, the band displayed a new patient prowess, something we hadn’t seen thus far in this era, allowing jams to organically breathe and collectively build. 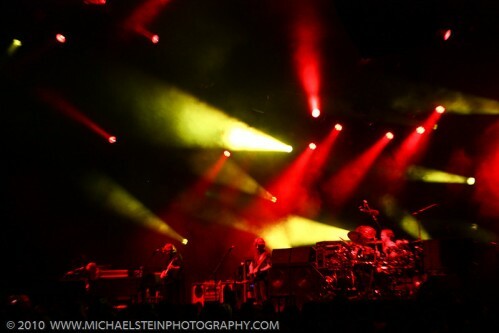 This type of playing had been foreshadowed at times last year, but with their listening skills and chops fully in tow, Phish 2010 is shining brighter now and ready for the future. Not only did Phish improvise better than on any other tour since their return, all parts of their game were considerably honed. Compositions popped with accuracy, transitions often happened seamlessly, jams weren’t cut off due to impatience or lack of direction; over Leg II, we undoubtedly witnessed the next step in the re-evolution of Phish. Armed with an aurally-stunning, magic guitar (a topic for another day) and a desire to mesh with the band’s musical fabric, Trey has let his rock-star persona slide in favor of a more intricate and collaborative improvisational style. The wailing solos were not as prevalent as Red darted and dashed around Mike’s lead bass lines, while, simultaneously, toying with Fishman’s rhythms. A selfless jamming emerged from the entire band, and it was this dynamic that formed the countless stellar jams from The Greek to Jones Beach. Jon Fishman had – by far – his best tour since the comeback, adding a whole ‘nother dynamic to Phish’s playing, while lighting a fire under Trey. Adhering far more to to his college philosophy of “never playing the same beat twice in a row,” the diversity and power of Fishman’s rhythmic offerings created a defining element of the band’s newest musical style. Debuted in The Greek’s “Disease” and furthered in the the next night’s “Rock and Roll,” Phish quickly introduced an original type of playing – a faster ambient music – that Fish framed with driving, yet delicate rhythms. 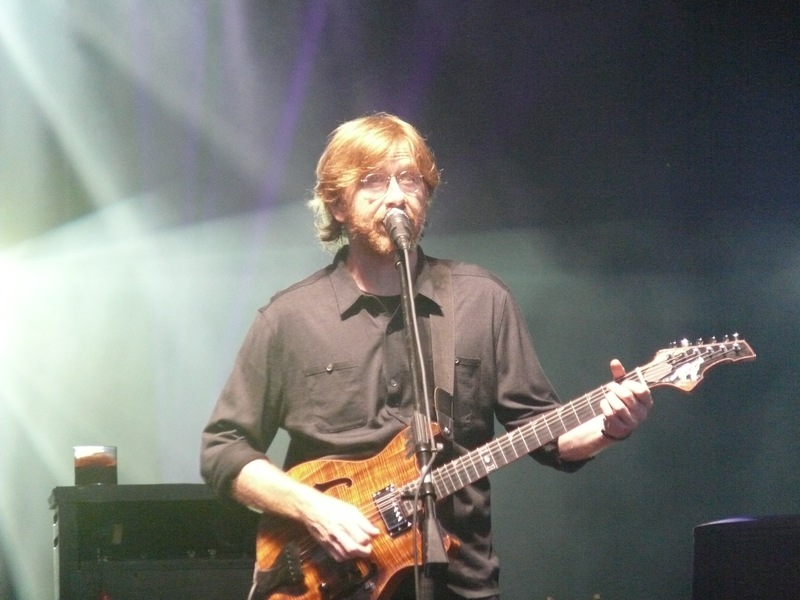 Exploring this style throughout the tour, Mike, Trey and Page often collaborated in melodic experiments over his ever-changing beats, bringing a new facet of jamming to their expanding game. Page’s piano figured predominantly in many maniacal jams, often bringing a retro feel to forward-looking pieces, while his use of the Rhodes was slicker than as ever, comping Trey’s minimalist sections perfectly. Mike Gordon, the man who has been there all along, continued his sonic dominance, leading and co-leading jams with masterfully unorthodox ideas. Throughout the Second Leg, Gordeaux’s ideas often spawned the most surreal segments of improv, as others were quick to follow his lead. But the most beautiful aspect of August was that all his band members finally caught up to him; most particularly, Big Ern. 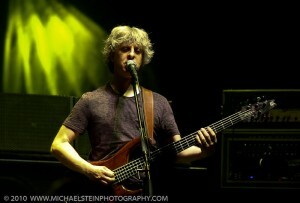 Learning a more cooperative way to play together, Trey and Mike can now legitimately be called the co-leaders of Phish. 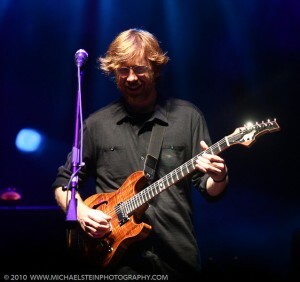 And with Trey’s new guitar boasting a much fuller sound, their tones work together like peanut butter and jelly. Aside from personal progressions over the past two weeks, Phish was consistently greater than the sum of their parts – as they always have always been during their best eras. By the time Alpine and Jones Beach rolled around, that subconscious flow had returned to the band’s music, jams, sets, and shows. Gelling on another level during Alpine’s opening night, and carrying this momentum through the end of tour, Phish proved they are a “force of nature” once again; a musical tsunami that can crush you at any time. With proficiency no longer a hindrance to creativity, Phish’s unbridled enthusiasm and success over the past two weeks point to another peak era on the horizon. With a rediscovered intent and a will to explore, look out come fall tour and beyond…Phish 2012…I like the sound of that. A monumental exchange of energy between Phish and their crowd, this outlandish groove-fest set the tone for the rest of tour. A smoking two-set effort on the second night of tour with tour-highlights in “Cities” and “Simple.” But don’t sleep on “Rock and Roll,” another example of Phish’s newest improvisational style. 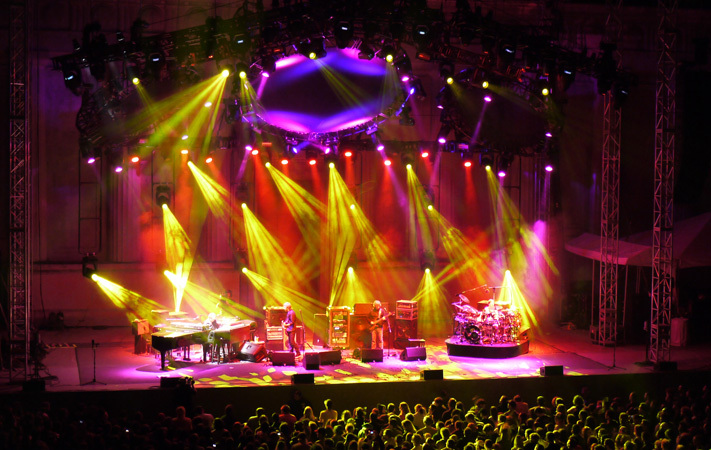 Our audio recap of Leg II starts with the tour opener in Berkeley, California. 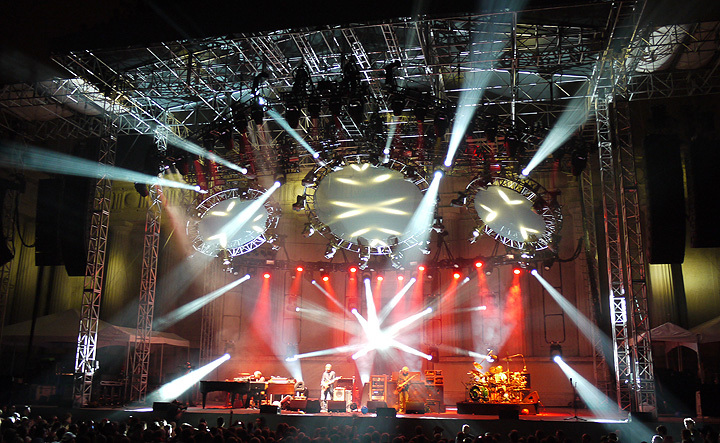 Kicking off the run with one of their most impressive multi-night stands since their return, Phish’s shows at The Greek provided some of the most memorable jams from the entire summer. The band’s playing grew more cohesive over each of the three nights, and here is the night one. This “Disease” jam gave us a sneak-preview of an improvisational style that blossomed through Leg Two – fast-paced, yet self-less and patient, jamming in which Fishman threw down intricate, changing beats while other band members painted layers of texture and ambient sound and melody. The first significant jam of tour brought us into some truly new-school Phish. Phish closed a game-changing summer tour with an exquisite final statement on the waters of Long Island Sound at Jones Beach Wednesday night. Sculpting one of the defining sets of 2010 with their final frame, the band crocheted a musical tapestry that contained improvisational strength, undeniable flow and setlist fire. Coupled with an opening half filled with anthems from “Disease” to “Antelope,” the tour finale culminated a transformative summer for Phish – a quartet that sounds far different than one year ago. While the band continued to progress all summer long, the season’s final four – Alpine and Jones Beach – saw a new level of sonic cooperation. Finally armed with unabashed confidence and the willingness to play within the context of others’ ideas, Trey has provided the final piece of the puzzle to a fully realized Phish. After this summer’s second leg, we need not talk about when Phish will hit their full stride again; over the past weeks, they have certainly accomplished that. No longer striving for proficiency, the band has freed themselves to explore new frontiers again. And over the past fortnight, they certainly gave us a glimpse of the future with many lead-less excursions stemming from collective musical motion. All of these elements converged on the final night of summer tour in an explosive display of all things right in the Phish universe. The band strung together several crowd favorites in the first set, capturing the local Northeastern audience with their only versions of August. 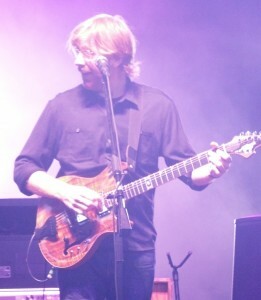 The greatest hits vibe of the first set reached an improvisational peak in “Ocelot” and “Bathtub Gin.” In one of the more creative and climactic versions to date, “Ocelot” came out for a significant play session before Phish punctuated an incredibly strong summer of “Bathtub Gins” with one more first-set barn-burner. 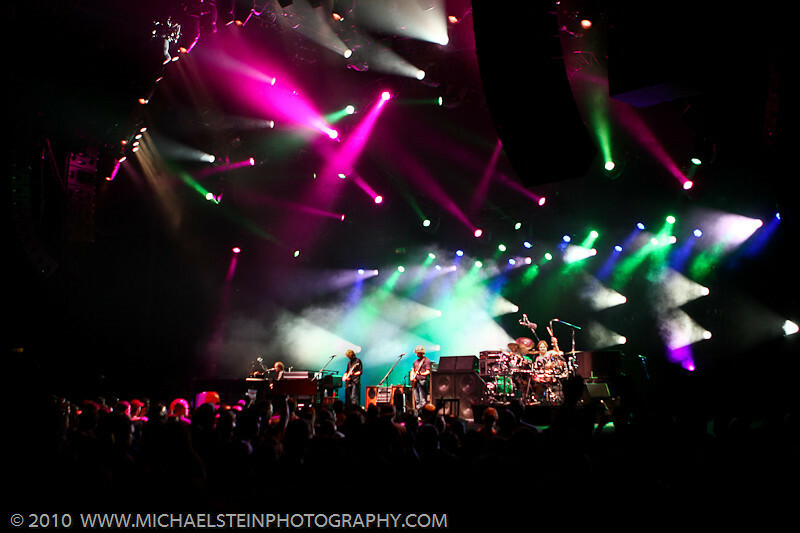 Hitting an early groove, Fishman, drummer revolutionized this summer, and Mike (a man revolutionized long ago) held down a dancy rhythm while Trey infused several multi-note runs into to mix. Harnessing the full sound of his new guitar – the singular most important treasure in the current state of Phish – Red let his passion flow in a triumphant farewell to summer. The unlikely pairing of “Tube” and “Destiny Unbound,” both appearing multiple times this summer, boosted the setlist’s sparkle, but as the band stumbled through “Destiny,” the show was more than ready to move on from the once elusive piece. Phish closed the set with another strong “Antelope,” one of their most frequent first-set closers of the year. Though so soon after Alpine’s top-notch rendition, this scorching version didn’t quite have the same impact. A strong, but not absurd, opening half set the table for Phish’s last set of an extensive, two-leg tour. Much like “The Sloth” led off for a dark “Disease” jam at Alpine, the band employed a similarly, heavy-toned opener with “Axilla” to spark an ominous sequence in “Timber > Light > 46 Days.” The only second-set “Timber” of this era carried a foreboding ambiance and a thunderous jolt of psychedelia to the beginning of the set – a sign of things to come. As the jam peaked, the band likened a collective avalanche with each musical rock tumbling over the next, gathering a single momentum while destroying anything in its path. Merging the last note with the opening hit of “Light,” the band entered the final summer version of their newest classic. Releasing their intricate mind games into heavy rock and roll, “46 Days” provided the perfect splash down for “Light,” a song-pairing that has continued to appear this summer. This brought the first segment of the set to a close, but instead of ending the song outright, Phish drew out its sonic residue as Trey built the opening licks of “My Friend,” fitting congruently with the sinister set. With their personal chops now strapped like weapons, all four band members shredded the complex composition, serving as perfect mid-set interlude. Without missing a beat, the band laughed right into “Harry Hood.” Centering another one of their strongest summer pieces, Phish built a cathartic mid-set version that served as an east coast counterpart to the masterful west coast rendition at The Greek. A song whose jam completely fits the band’s current state of ego-less jamming, “Harry Hood” regained its core majesty over the summer of 2010. Another blissful escapade in universal harmonies, this version blossomed into a sacred sound sculpture that saw Trey unleash several spine-tingling licks. A throwback to the glory days of the song, Phish has recaptured the essence of their early-day opus, crafting transcendent realities every time out. At this point in the set, “Tweezer” seemed like a long-shot, but sure enough, the band build a musical bridge from the peak of “Hood” into the opening licks of their seminal jam. Exploding in surprise and delight, the audience cranked the show up a notch as we, unexpectedly, stepped into the freezer. A perfect illustration of how time is no longer a barometer for great jams, Phish got straight nasty within the course of an action-packed and addictive ten-minute musical montage. The band fully dove in as one, crunching out some urban grooves before Trey hopped into his laid-back ride. Again building, and peaking, a jam without taking it over, Trey left his rock-star persona aside for more group-oriented playing. Without a one-dimensional, guitar-based climax, the piece took on a whole different type of momentum within a ten-minute vortex. Smooth and direct, this version infused the set with a late set dosage of larger-than-life rhythms. Oozing into “Horse > Silent,” Phish set up the “YEM” closer everyone knew was coming before the tour ever began, But there is something about the New York metro area and “You Enjoy Myself” that always seems to jive. With nuanced communication and a locked-in groove, Phish styled their way through a gritty funk-down to finalize their most eventful tour since their return. Letting loose on his magic guitar, Trey took center stage as he crushed the second half of the jam with a Big Apple sized-solo. 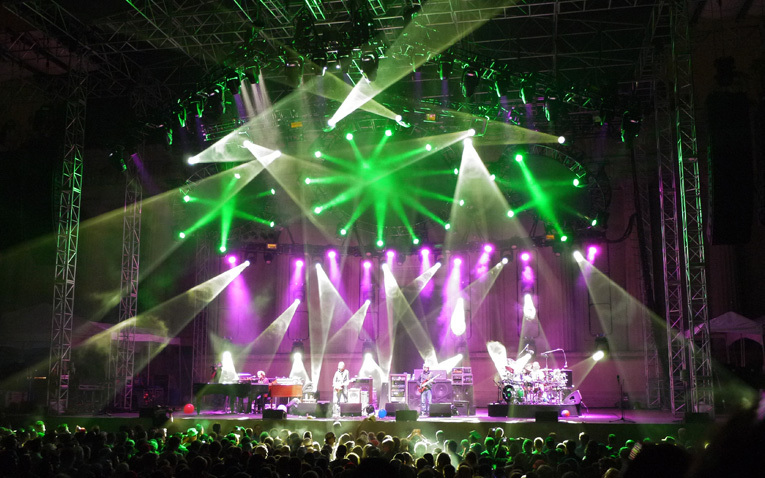 Providing a rocking re-entry into the world through “Suzy,” and “Reprise,” Phish put a exclamatory cap on the a summer tour that will not soon be forgotten. Up until this point, the story has been redevelopment, but from here on out, the plot lines will largely be determined by imagination and creativity. Phish 3.1 has officially arrived.